The women who have been fighting to return to work in Belchatow Hospital have won their jobs back! They will have work contracts through the new service provider. We think this outcome shows that if you organize, stay in solidarity and don't give up, it is worth it. We consider this victory, which happened outside the mainstream unions, to be the most significant we know of so far this year in Poland. We thank everyone who supported this struggle. We however note that there are still problems since the workers have not been compensated for lost time and have not been hired directly by the hospital. The union in the hospital will continue working to improve conditions and fight for better job security. Workers at the call center – help desk giant Atento from several unions, including the CNT, are on strike today in Spain against planned reductions. More than 800 workers are expected to lose their jobs, although the firm plans an increased workload in the near future and is currently recruiting. Atento is the second largest firm in this industry and had well over 2 billion dollars in revenue last year. It employs 155,000 workers in 16 countries. The firm was created about 15 years ago when the company Telefonica decided to transfer their call center and other services to a new company that it would own. In 2012, it was bought by Bain Capital, a US holding company, co-founded by Mitt Romney. Bain decided to float the company this year and, in order to make the company more attractive to investors, they decided to cut the workforce. At least 823 jobs will be cut in Spain. While cuts are planned, an increased work load is expected, as some tasks sent to Latin America will be sent back to Spain. In general, the workers have been complaining about increased workload since Bain Capital took over in 2012. 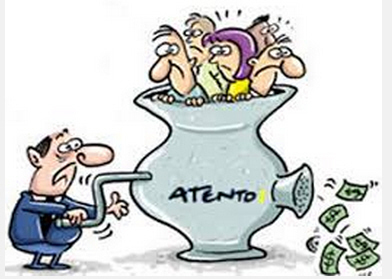 Median salaries in Atento Spain are about 750 euros per month. The redundancy plan is now in a 30-day consultation period and strikes are planned throughout the month. The IWA would like to express its solidarity with the workers against the corporative greed of those who will destroy more jobs and squeeze more work out of those still employed to make even more money. We send special greetings to the comrades of CNT in Madrid and Leon who are unionized in Atento. At times like this, syndicalists can be targetted so we wish them much strength for the upcoming struggle. NO TO THE ERE AT ATENTO! The IWA condemns the actions of a Domino's Pizza in Vigo, Spain, which has unfairly dismissed Emilio, a long-term employee with no previous problems at work. After working there for 9 years, the company decided that the unionist must go and dismissed him for an alleged small theft in the restaurant. The CNT union considers that this allegation was made as a pretext and to avoid eventual compensation they would have to pay for unfair dismissal. 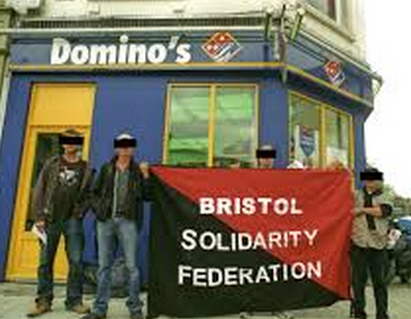 The CNT has been picketing Dominos in response and on July 7, this case comes to court. We are sending a notice to Dominos that a conflict with the CNT is a conflict with all of us. If this situation is not resolved, we will mobilize ALL OVER THE WORLD. You have already seen us do this. DO NOT TEST US AGAIN BECAUSE WE WILL NOT TOLERATE ATTACKS AGAINST OUR MEMBERS. Dominos Pizza, enough is enough! Immediate compensation for all time he was without work! Stop the harrassment of employees! 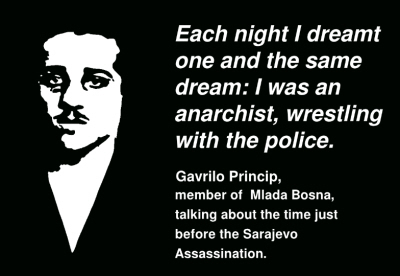 Each night I dreamt one and the same dream: I was an anarchist, wrestling with the police. We live in an era of the onslaught of the ruling class conducted at all fronts, hence no wonder it is so easy to detect tendencies toward criminal reinterpretation of historical events, accompanied by revisions of history fashioned on the day-to-day necessities of bourgeois politics. Anniversaries, along with other commemorative festivities organised around various events of history, are such occasions when we can percieve this dark tendency inherent to the system in the most blatant of ways; these are the situations in which the ideology of the ruling class crystalises. Marking the centenary of the assassination of the archduke Franz Ferdinand, the heir to the Austro-Hungarian throne, and, shortly afterwards, the beginning of the WWI, are particularly revealing examples in this sense. Without a proper understanding of the historical context. it is not possible to grasp the events that took place a hundred years ago, just as this understanding is not possible in the case of Ferdinand’s assassination without a proper understanding of the specifically Yugoslav character of this context. The error one should avoid in the most careful manner, if one aims at scientifically tackling the matter of analysis of historical happenings, consists in projecting one’s own views and values on the past and making faulty analogies with contemporary events. Unfortunately, today we witness precisely this type of proceeding, infused with a large quantity of forgery and unverified information, day-to-day juggling with the facts of history, tentative recuperations of the attitudes of revolutionaries and their inclusion into the context of Serbian nationalism by the current regime in Serbia and also of the racist stance on the part of some Western European intellectuals and institutions, not forgetting indeed the bizarre coining of non-existant links with events from the recent wars in the Balkans. One should keep in mind that nationalism, as a new phenomenon, was rather amorphous throughout this period and that national, confessional, as well as political notions, which were supposed to be opposed each to other, in fact, coexisted and only at the moments when diverse affinities engaged in overt conflict in the minds of the people the issue of choice between these emerged. This also stands for the movement of the Yugoslav revolutionary and national youth prior to 1914. Undoubtedly, having as their primary focus the position of the unification of South Slavs, the ideas of social justice, federalism, anti-clericalism, anti-parliamentarianism, and anarchism also played a notable role in forming the awareness of younger generations in Slovenia, Croatia, and Bosnia and Hercegovina, which were then ruled by the Austro-Hungarian Monarchy. Social struggle is not a crime! 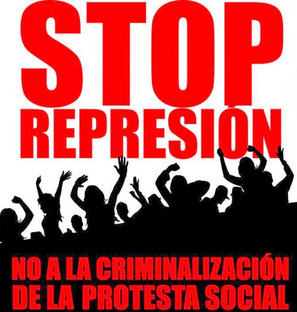 Solidarity against repression! We want to express our support and solidarity with Carlos and Carmen, who participated in the Granada 15M picket during the General Strike on March 29, 2012 in the state of Spain and who were convicted to three years and one day imprisonment for their participation in this picket. For the General Strike in Spain on March 29, 2012, the Granada 15M movement organized an informational picket that swept the streets of the city calling for solidarity with the day of strike. Carlos and Carmen were randomly identified by the police out of a bar where the picket had entered. During this picket there were no violent attitudes or threats and, in fact, the picket continued its passing by Granada and the bar was not closed. The bar owner filed a complaint and some months later a trial began in which the prosecutor asked for an "sentence to set an example, not only for them but also so that none else comes up with similar things". Finally, the judge sentenced Carlos and Carmen to three years and one day imprisonment for an alleged "crime against the right of workers". Following the conviction, an appeal was brought to the Granada Provincial Court, but this upheld the verdict based only on the testimony of the bar owner. In recent years in Spain, repression against social movements has developed from fining participants in social protests into sentencing them to imprisonment. Meanwhile people live in a context of insecurity and spending cuts, while the government introduces law reforms meant to stop social struggle. And we cannot allow it. We call on every city to go out onto the streets on the 28th of June to follow the protest evoked by this repression and injustice. 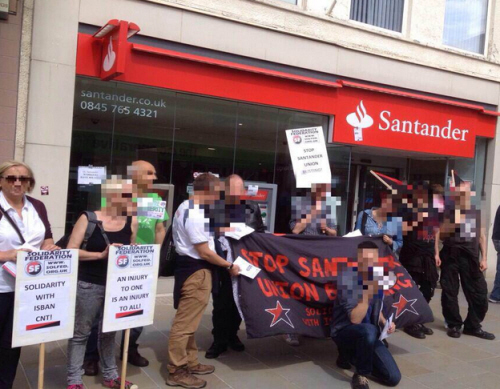 New IWA day of action against repression and outsourcing in Santander Bank, Isban and Panel Sistemas. Last June 5th, a new day of international and class solidarity against Emilio Botín's multinationals took place. Several sections of the IWA showed that the real unionism is the workers themselves without leaders, horizontally organized, and without public or private subsidies. This is the fourth international day of action supported by the IWA unions, since the conflict started in August 2013 by Madrid CNT-AIT Union of Telecommunications and Computer Services. During the conflict, hundreds of solidarity actions took place in 13 different countries, including pickets, symbolic occupation of bank branches, cast of thousands leaflets, faxing, and e-mails and other boycott actions. The CNT-AIT in Spain informs that there is still an open conflict with Portinox company, part of the Teka Group, due to the dismissal of the union delegate in Granada for union activity. The International Workers' Association supports the demands for immediate reinstatement of the delegate. We inform both Portinox and the Teka group that we have no tolerance for union busting firms and companies which take such reprisals against union members. You may expect continued protests against your firm until the situation is resolved. At the end of April, 60 women suddenly found themselves unemployed at the hospital in Belchatow. Since then, a large group of them have been fighting to get their jobs back. The women had already been outsourced from the hospital and had been working there through a company called Cooperative for the Disabled „Naprzod”. This company is no cooperative in the normal sense, but a firm which exploits disabled people, mostly women, across Poland. The contractor at the hospital was changed to another firm called „Dozorbud” and „Naprzod” claimed that the workers had been transferred to the new company. But Dozorbud didn't take most of them to work, instead looking for new hires with no qualifications or experience. Presumably also without any work contracts and on subminimum wages. Since then, the women have been sitting in at the hospital, demanding their jobs back. 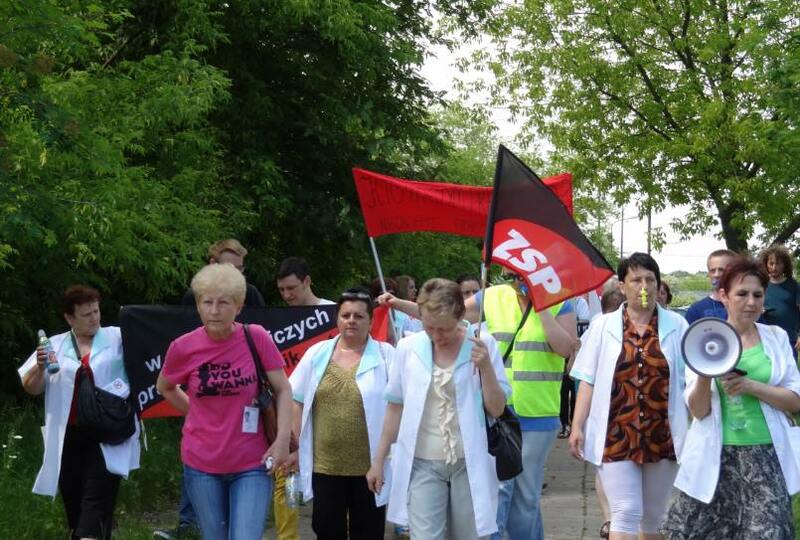 Workers from the hospital in Belchatow, Poland, are fighting for their workplaces. .
Around Poland, hospitals have been outsourcing various services such as cleaning and cooking. When the workers are outsourced, their working conditions become worse and their jobs more precarious. Cleaners and food servers from Belchatow hospital were outsourced some time ago. This hospital is managed by neoliberals from the ruling party and has a history of union repression. Our comrade was fired for union activity from this hospital. (He was working through a mainstream union at that time.) The mainstream unions have absolutely no interest in the outsourced workers. ZSP does. When the contractor changed, it is usual that the workers are transferred to the new company. The company that they were working with did not follow the law. 60 women lost their jobs. Women working at the new company are working without any contracts at all. On May 24, 23 protested at the hospital and will continue will more protests at the offices of the contractor and the province. We demand direct employment of the workers and compensation for all the time they are without work.